I love TopShelf. I first encountered it when I was looking at MassTransit. Both MassTransit and TopShelf originated from the same developers (Chris Patterson and Dru Sellers). The NServiceBus host is also built with TopShelf. What TopShelf allows you to do is to write a service as a console application – which is great for development and testing – but to deploy it later as a Windows service. You do this by simply by passing in some command line parameters to the console application. Fantastic. I have been encouraged to look at Nancy by a colleague (thanks Matt!) who has used it on a number of projects. It’s been on my radar for a while but somehow I’ve never got round to looking at it. As it happens for a small side project I’m working on I need to expose some JSON data from a service. How opportune! I also added a few other packages for logging, configuration and JSON serialisation but they aren’t core to the task at hand so I’ll ignore them for now. The first thing I did was to define a service contract - an interface - for the service that would be hosted by TopShelf. /// or manipulating venue data. The Start() and Stop() methods align with the TopShelf service configurator that allows you to assign actions when a service is started and stopped. More on that later. The implementation of the interface would be the service to be hosted by TopShelf and which would spin up the Nancy endpoint. Let’s see what that looked like. /// Initialises a new instance of the <see cref="VenueService"/> class. /// Starts the service. In this case it starts the Nancy endpoint. /// Stops the service. In this case it stops and disposes of the Nancy host. The interesting stuff appears around line 63 in the Start() method. 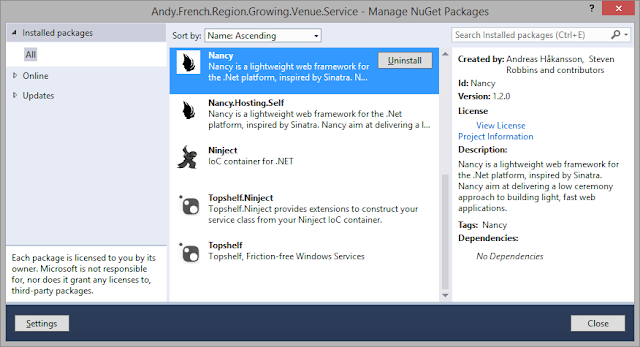 Here I create a Nancy host and start it. 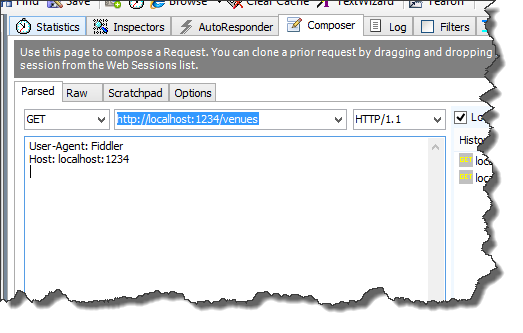 The URL passed in (the hostUrl) is loaded from configuration but its actually something like http://localhost:1234. In the Stop() method I stop the Nancy host and dispose of it. Basically, this is all the code it took to get the Nancy host up-and-running but there was a little bit of plumbing required to set up routes and handlers. At this point I had a Nancy host but that was only part of the story. I also needed to define a route and a handler for an HTTP verb (e.g. GET). It’s actually very easy to do this in Nancy and is accomplished using a Nancy module. /// A Nancy module for the venues service. /// Initialises a new instance of the <see cref="VenuesModule"/> class. You can see that I created a class that extended NancyModule and defined a route and a handler in the constructor (line 33). This basically says that we are expecting GET requests to arrive at ‘/venues’ and defines what we want to do with them. 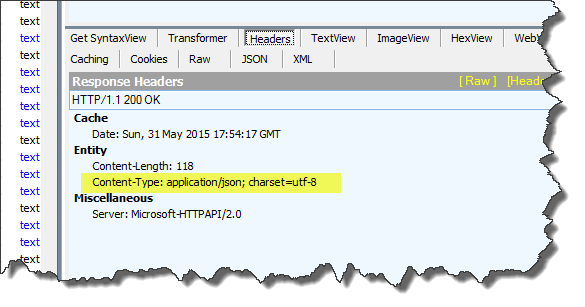 In my naïve service I simply load a JSON file and return the contents in the response as JSON (line 36). /// Loads the module into the kernel. /// The main application program. Aside from some log4Net configuration that was pretty much it. Hitting F5 in Visual Studio resulted in the console application being launched and the service starting up. 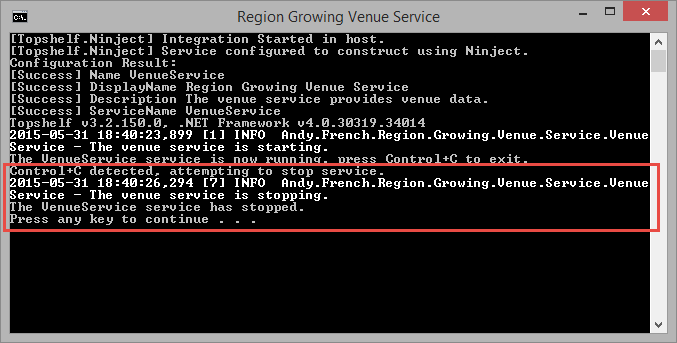 You can see the INFO message indicating the Start() method of the service has been called and therefore the Nancy host has been started. Using the Fiddler composer I fired a request at the service. This resulted in JSON being returned (albeit a small incomplete example at this stage). The content type was correctly set to application/json. Hitting Ctrl-C caused TopShelf to call the Stop() method of the service which stops and disposes of the Nancy host. That’s it! All too easy.